I spend a fair bit of time each morning on the bridge watching the officers maneuver the ship during mooring deployments (sometimes in unthreatening conditions they let me drive), and after each session, I come away with deep admiration for their skill and seamanship. (Second Mate Derek happens to have the morning watch, but this applies to all three mates and of course the captain.) Admiration extends also to the people on the stern actually doing the deployment, to the chief scientist—and the ship—for together they form a skilled unity. 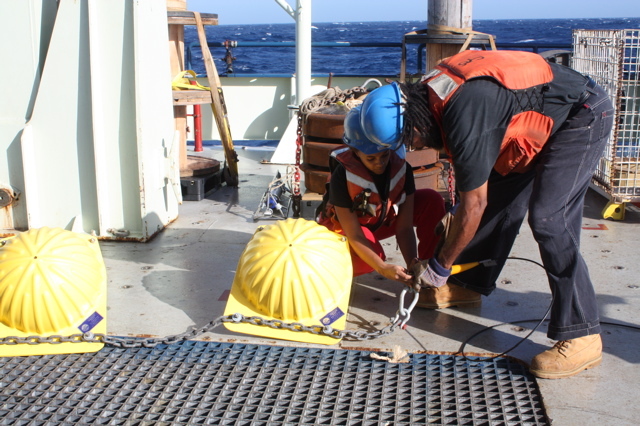 Their unified objective is simple to say: Drop the assembled mooring in the precise location Lisa has chosen. From there, things grow more complicated in the execution and the explanation. First try to visualize the deployment technique. Today’s mooring is some 4,000 meters long. The wire, wound around a huge winch drum, is paid out gradually as the team, led by Robert and Mark, including Bosun Bill, Chief Mate Dee, two winch operators, and several deck hands, attach the components and put them over the side. 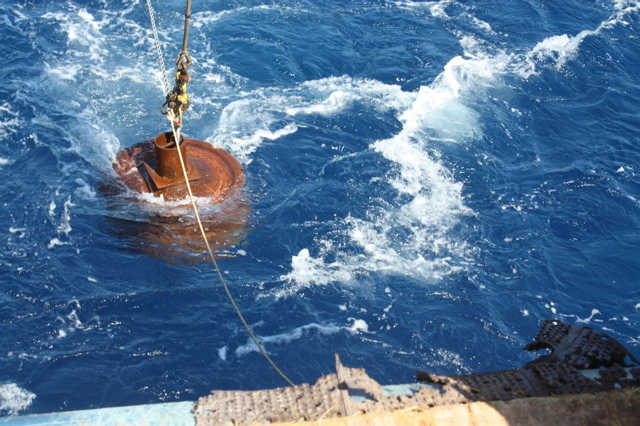 The mooring is assembled and deployed from top to bottom. First comes the top float, last the anchor, and all the instruments and additional flotation must be attached to the wire in descending order according to Lisa’s plan. Gradually, the string of stuff, still on the surface, grows longer and longer, and by the time they’re ready to splash the anchor, the top float lies so far astern it can only be seen with binoculars. That’s the process; that’s easy to visualize and to explain. Now things get tricky. That’s because of the ancient elements—current, wind, and waves—the ocean itself. Now those old seamanship skills enter the picture. The ship is armed with a remarkable electronic aid, the Dynamic Positioning System (DPS). Unlike normal ships, Knorr is driven by those “thrusters” (See photos in yesterday’s post), two on the stern, and another in the bow, that can be pivoted 365 degrees. The thrusters can be positioned such to keep the ship stationary, literally stopped in the water or they can be positioned to make her move sideways or in any other direction. 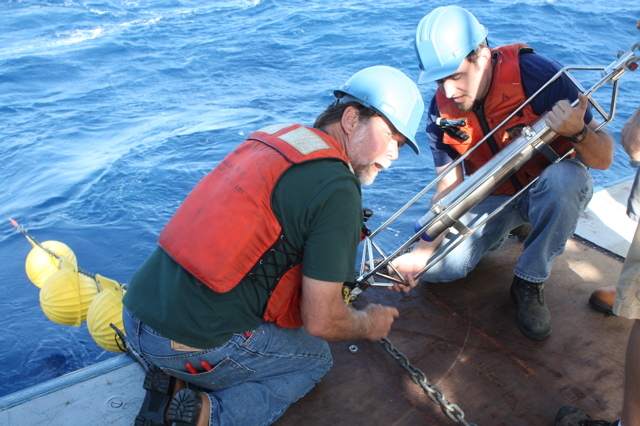 That’s a revolutionary development in ocean research, but when you put gear overboard, you can’t just press a button and tell her to stay right here—again because of the ocean elements—and because of the necessity to keep the mooring streaming straight aft of the ship as it’s being deployed so that it does not tangle. Also, you can’t tow the mooring through the water as it’s being assembled at much over 1.5 knots or risk damaging the instruments, even breaking the wire. Now Lisa and the officers knew the strength and direction of the two forces, wind and current, acting on the ship. They knew where they wanted the ship to be when the mooring was fully assembled and ready to drop. 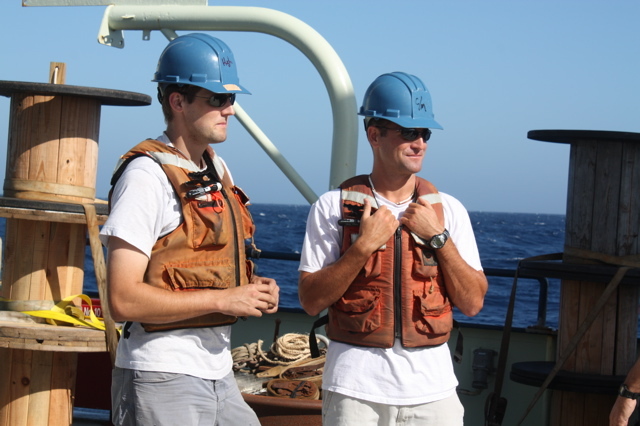 And they knew from Robert and Mark’s experience how long it would take to assemble a 4,000-meter-long mooring—about four hours. It would be fairly simple to position the ship if current and wind were coming from the same direction, but they weren’t. The Agulhas was flowing southward, and the wind was blowing from the northeast, forming an “angle of forces” of about 90 degrees. That’s trickier. But we might think about the general concept in terms of a parachutist who wants to land in a given spot. To determine when to jump in order to hit that spot he must compensate for the wind and the speed of the airplane. If he jumps too soon or too late, he’ll miss his spot. So after the meeting of the minds on the bridge, Derek decided how far upwind and up current and at what angle between the two forces he needed to position the ship at the beginning of the deployment such that, four hours later, she’d be located right over Lisa’s desired position. Since we’re dealing here with nature’s elements, this can’t be predetermined with absolute precision because wind speed and direction tends to change, and weather forecasts are not always accurate over the short run. To simplify matters, he positioned Knorr the bow toward the wind, thus decreasing but not eliminating her windage. That put the current on the port, the left side, of the ship. He then gave her enough gas to overcome the force of the wind, and he let the current push the ship almost sideways “crabbing” toward the desired position. When naturally she fell out of position, he would add or subtract speed or change her attitude in relation to the wind, careful always to keep the mooring streaming straight aft in the current. Precision like this would not be possible without the Dynamic Positioning System. Like a video game, the DPS has a big screen that graphically shows the ship’s position in relation to the desired objective and to wind and current. Ship’s speed and direction are controlled with a joystick. But this is by no means a set-it-and-forget-it system, again because we’re dealing with nature. But that’s okay. The mate on watch is a seaman in the old sense, in touch with the elements, aware when one or the other changes, ready to add a few engine revolutions or adjust the heading a few degrees, ready to let nature’s forces work for him (or her) when the opportunity arises, instead of fighting against them. He is definitely not merely the operator of an electronic system that does the thinking for him. 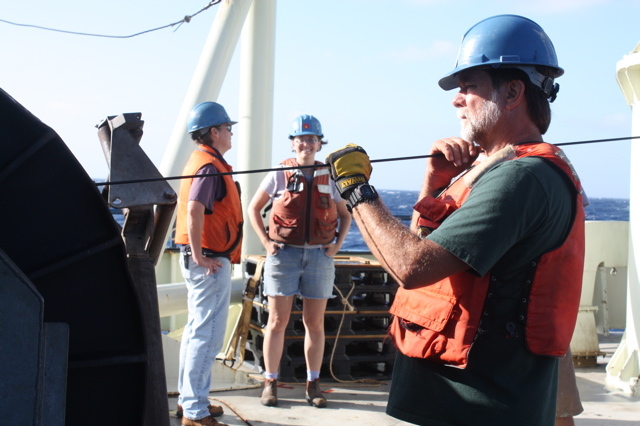 I happened to be on the stern handling one of the control lines on the anchor as we raised it above the deck. “Two minutes,” came word from the bridge over the bosun’s radio. Oh, wait, there’s one other variable that needs to be accommodated. 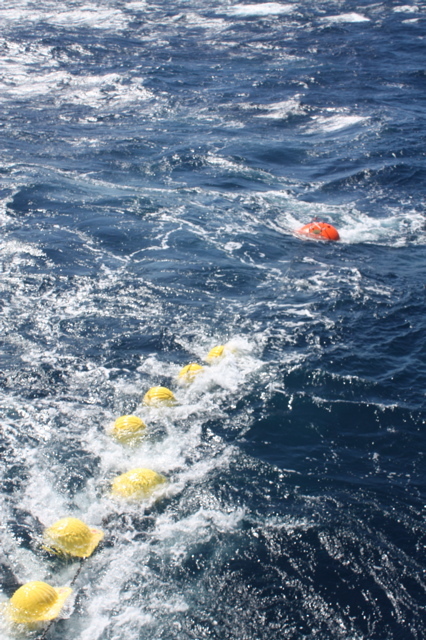 They call it “fall back.” See, there’s all this flotation on the mooring wire streaming 4,000 meters behind the ship. If there were no current, the flotation would pull the anchor backwards as it sinks. In that case, the ship needs to be positioned a little short of the desired spot before dropping the anchor. 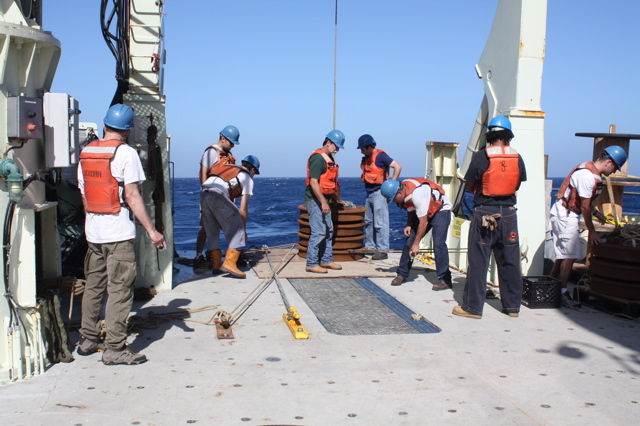 (In the event, however, the team determined that, after figuring fall back in relation to the length of the wire and the force of the current, that the mooring would land a little forward of the ship’s stern and away a few meters to starboard. Splash. Spot on. Briefly, we watched the yellow hard-hat floats race toward us before they vanished. Bridge, deck, and scientist—they made it look routine. We went to lunch.